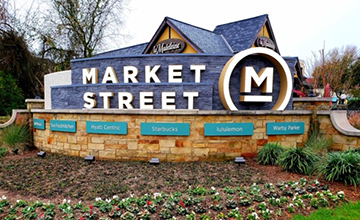 Market Street took on a new look this winter in The Woodlands, Texas. 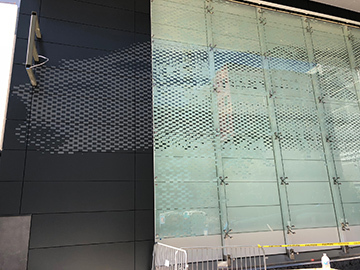 The renovation included pedestrian pathways, renovation of the central park area and the fabrication of signage and lighting that enhances our clients new logo and branding. It’s been a ton of fun and our techs and painters continue to do an amazing job. We worked directly with the Seattle Mariners to create this anamorphic graphic at the stadium. 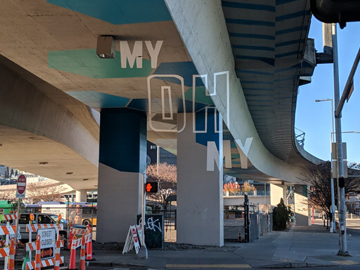 This underpass is the main bus stop for the stadium and, in a short amount of time, has become a Seattle landmark. 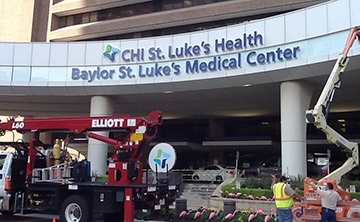 Coast2Coast Signs installed this backlit channel letter sign on the facade of Baylor St. Luke’s Hospital. We deployed our 60 Foot Elliot Boom Truck to install the channel letters. 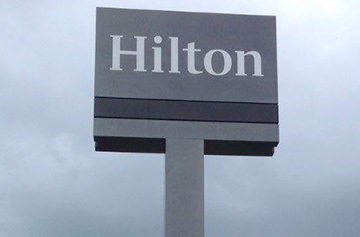 Coast2Coast Signs installed a large illuminated sign for Hilton Hotels. In addition to pouring the foundation for the post, our crews handled all of the electrical work. Take a look at our recent sign installation and maintenance projects from around the greater Houston area. The safety of your jobsite is our highest priority. See what makes our safety record industry leading. than great signage. Learn why. Ethics you can count on. Coast2Coast Signs maintains the highest standards in our business practices. View videos and pdfs of Coast2Coast Signs press mentions. More than just signs. Our professional crews have experience repairing every kind of wall surface. From planning to electrical work, Coast2Coast Signs can meet all your signage construction needs. Have a problem with an existing sign? Call us 24/7 for superior service and time proven products. Coast2Coast Signs provides full service sign installation and maintenance for the greater Houston area. Call us to discuss how we can help. Do you prefer to work with firms who give back to their community? See how Coast2Coast Signs contributes. As the premier sign installation company in the Houston area, you get consistent quality. No matter what type of sign installation project you have, we have professional crews with the expertise you need. From banners to monument signs, see our sign installation and maintenance projects from around the Houston area.